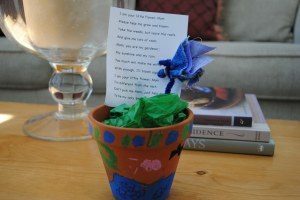 For Mother’s Day this year, my son gave me a hand-painted ceramic pot with a fabric flower inside it. It was the perfect gift for me because I don’t have a green thumb. But after reading the poem again the other day, I realized that, even though I may not have much success keeping plants and flowers alive, I’m still a gardener. is helping them to bloom. « So you want to write a children’s book? Oh no. No green thumb here. I kill flowers & plants. Gardening is definately not in my jeans. I'm not a natural at either. It's all trial and error and lots of prayer for me. Absolutely love the poem. I'm on round THREE of THIS years zucchinis and cucs. So you tell me. lol. That is the sweetest poem!!!! But it is far to early to think:O)HA! I am a horrible gardener too! 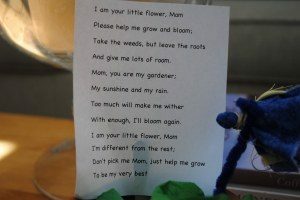 That poem from your son is very sweet and true. I have a "brown" thumb; I did plant some basil and cilantro yesterday with my husband and kids. Hope they survive, lol. I'd like to work on the skill of gardening, I think it comes in handy to help me cultivate more patience, perseverance, and nurturing ways. What a wonderful keepsake! I love to garden, just not in this 137 degree heat we are having. Have a great week.